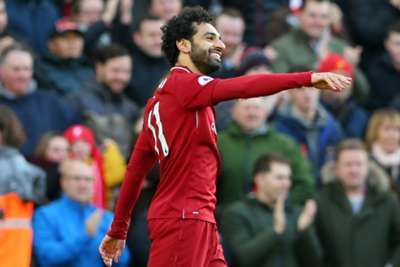 Liverpool manager Jurgen Klopp insisted he was never worried about Mohamed Salah's form after the forward scored a hat-trick against Bournemouth. Salah's treble helped Liverpool to a 4-0 win and to the top of the Premier League table on Saturday. The Egypt international is yet to recapture his incredible form of last season, but is now up to 12 goals in 22 games this campaign. But Klopp said he was never concerned by Salah's form despite the questions surrounding the 26-year-old. "Look, your business [the media] is a difficult one as well – you have to judge always the moment," he told UK newspapers. "I'm interested in the moment but I never judge it because the moment is just a little part of all what we do. So I was not for one second worried." Salah's first season at Liverpool was an incredible one, scoring 44 goals in 52 appearances for the club. Klopp said the forward also needed to learn to deal with expectations after his prolific 2017-18. "We have to develop always, and to confirm and to improve again on a 41-goal [sic] season. Everybody would struggle a little, because how can you improve on that?" he said. "If you score in the first five games 10 goals everyone will say, 'Yeah, it's going to happen again'. And then if you ended up with 39 people would say, 'Yeah, but it's not 41'. "And we all have to learn to deal with it, and him of course as well. That's how it is. "He's never had a season like that before, and he wants to have the season again. But you have to make it step by step, so that's what we do." Liverpool have a crucial Champions League clash at home to Napoli on Tuesday before hosting Manchester United.